This is the smallest bedroom in the house, and at first we were going to have both girls put their beds in here and use a different bedroom for their toys, desks and “stuff.” But my 7 year old is ready for her own space, to the point that she willingly took the closet-less maid’s bedroom. 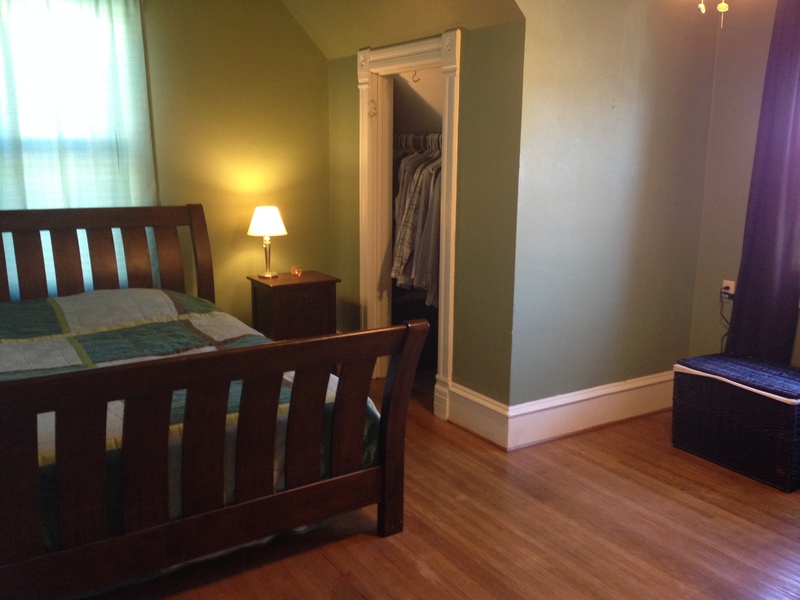 At least it has some cool ceiling lines, and it is big enough for a twin bed, a desk and a dresser. 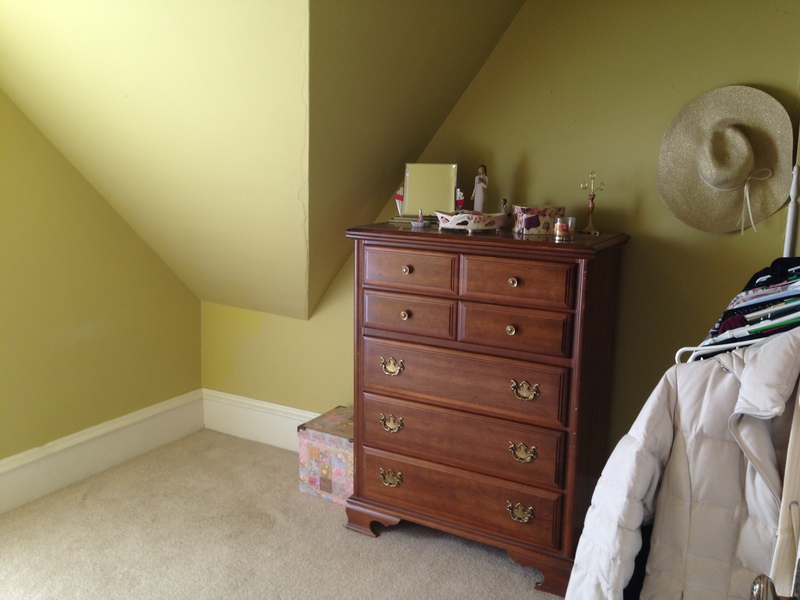 The paint we chose was “Sea Anemone” by Glidden. 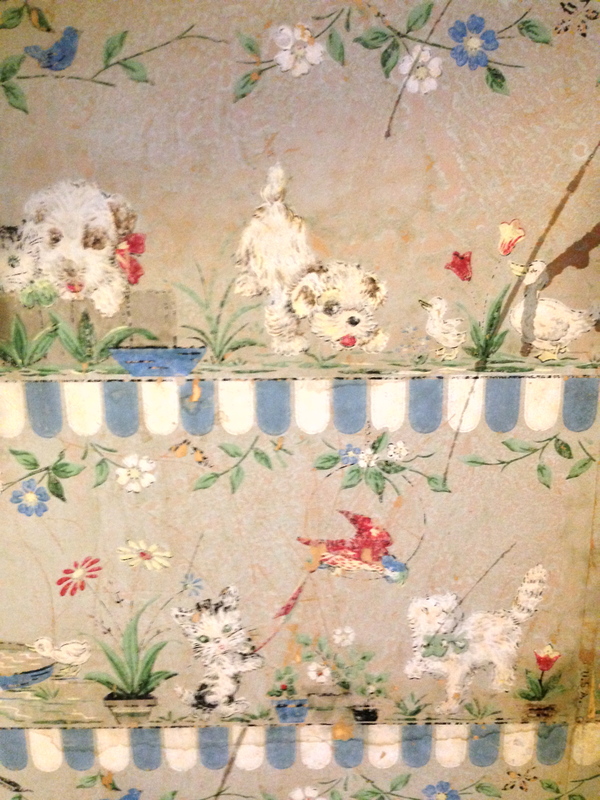 The walpaper we found underneath was in perfect condition. I am guessing it is from the 30’s or 40’s? Looks like this was a nursery. If I had been doing this room for a younger child, I would have definitely left this on at least one wall. Love the grey background. The light is so bad! It actually looks much better than this- I love how it turned out. 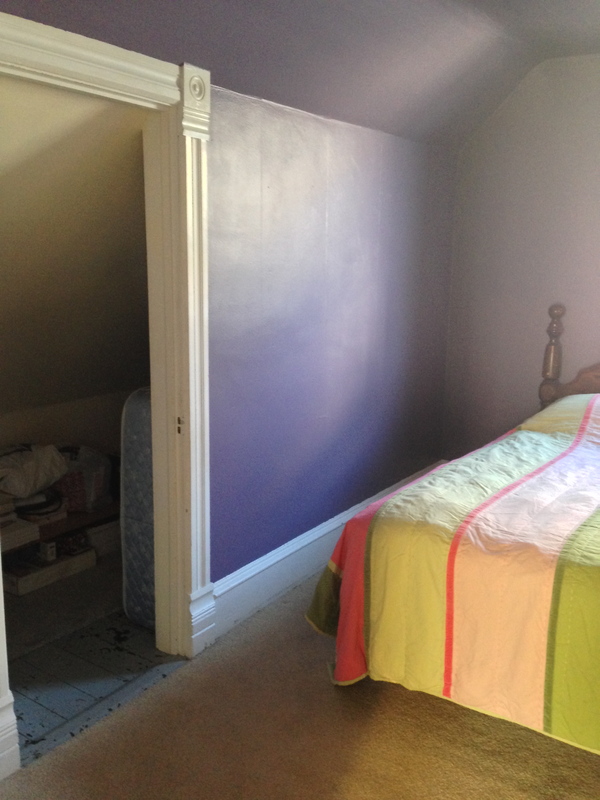 Room #2: It was painted a grape color on every wall. Even the ceiling was purple! 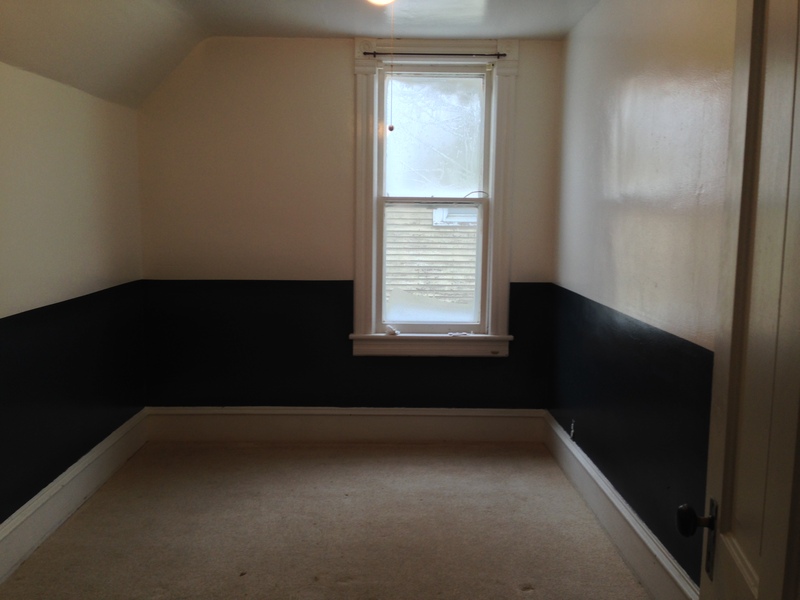 Since this was to be my son’s room, painting it was a no-brainer. I chose Sherwin Williams “Pure White” for the walls and ceiling and “Sea Serpent” also by SW for the bottom of the walls. 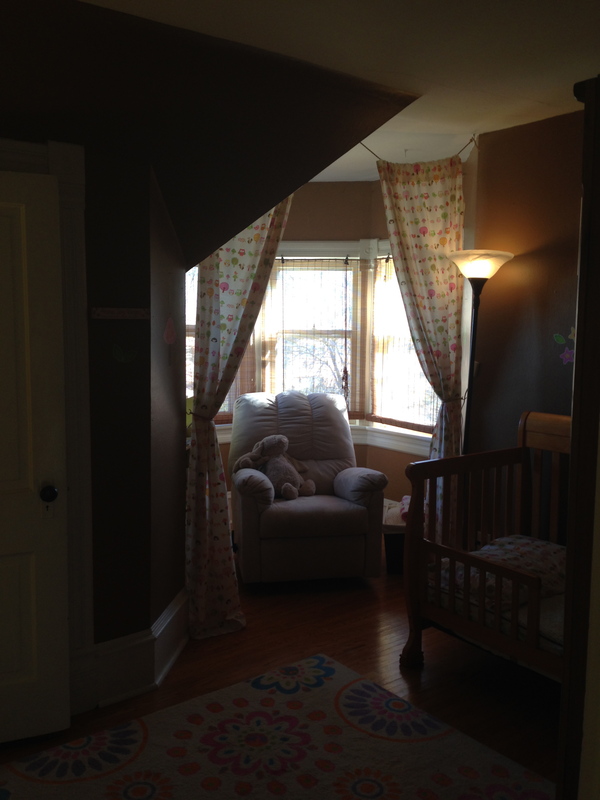 Bedroom #3: The princess room. This room is a to-die-for little girls dream bedroom. Luckily, I had the perfect little girl for the room. 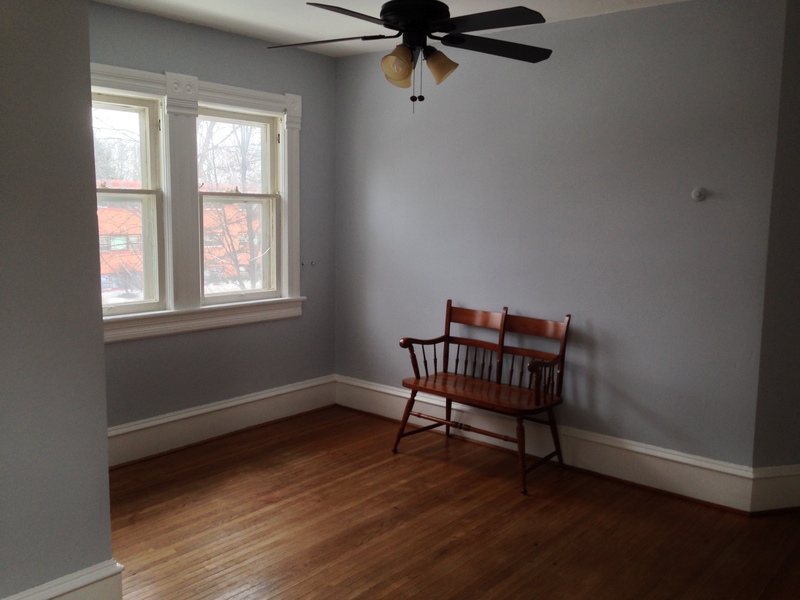 The room was painted a dark chocolate brown, which when combined with the lack of a working light fixture in the room, made for very little light, which was a cryin’ shame in a room like this. 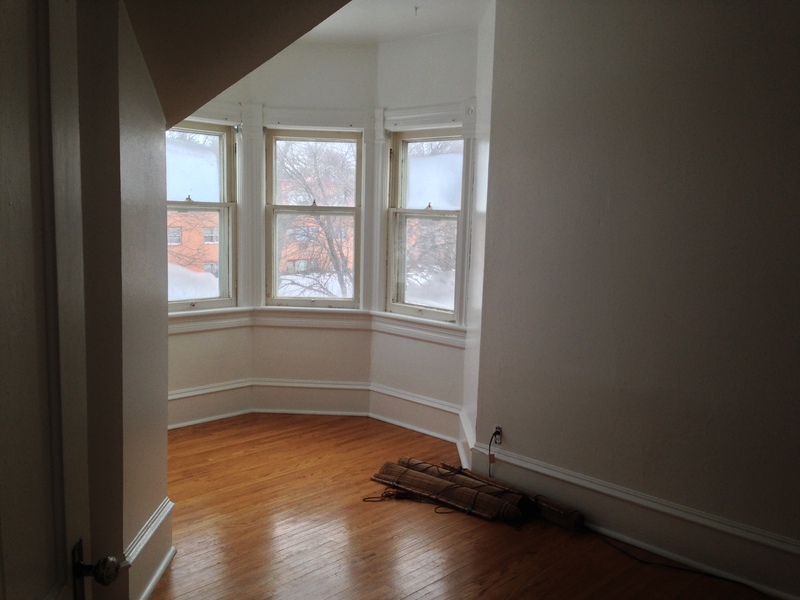 We painted the room “Pure White” by Sherwin Williams. It would have been beautiful in many colors, but because my daughter has a lot of bright accessories for her room, I thought using a white background would make these things pop. Bedroom #4: The Master. 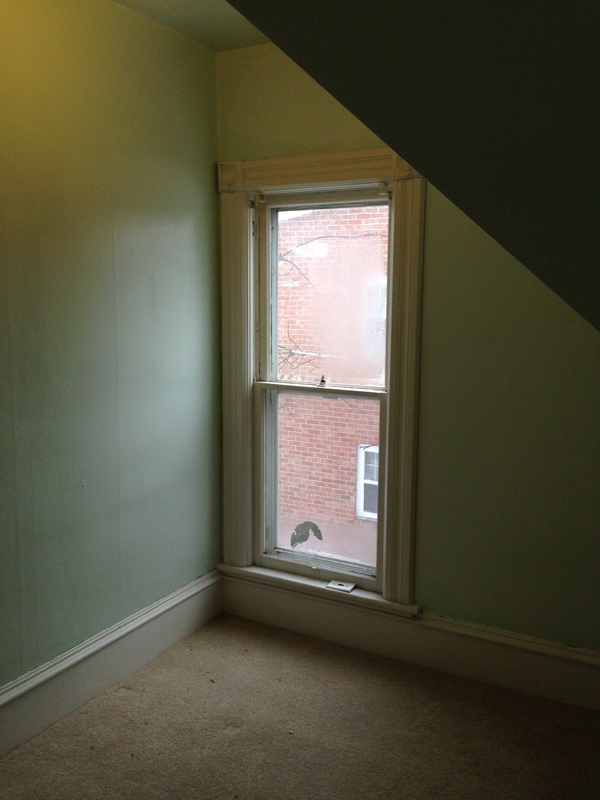 Was painted a medium sage-green (even the ceiling!) Not working for me. 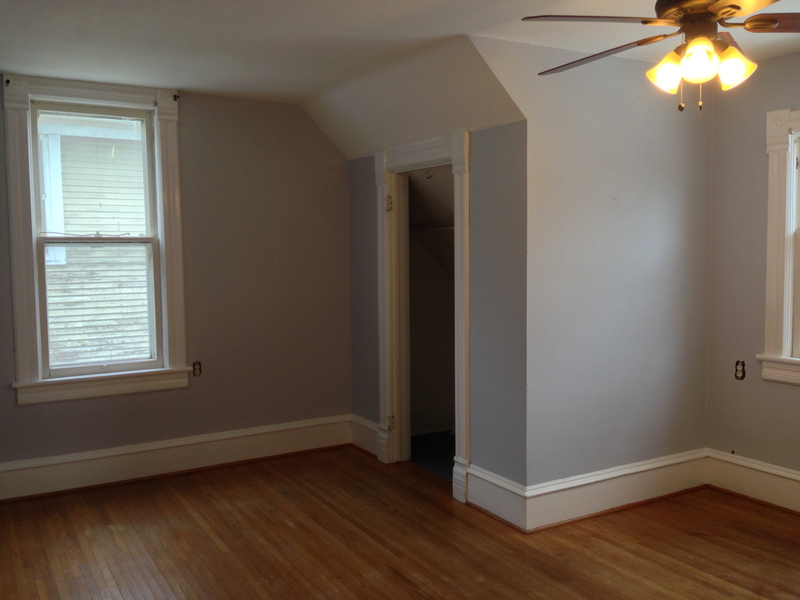 After a coat of flat white on the ceiling, “Decorator’s White” on the trim, and “Sweet Innocence” (all by Benjamin Moore) on the walls, it was much lighter and brighter. 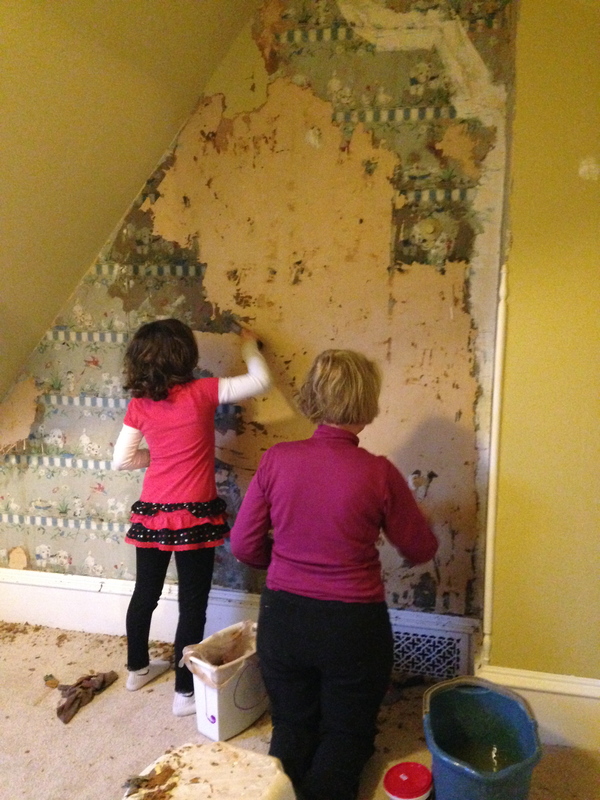 I love what you are doing to my families former home! My name is Colleen and I am the youngest child of the Gill Ristesund family. Wish I could be there this weekend to go through the house with you, but we just moved to FL. I lived in this beautiful victorian home for the first 22 yrs of my life (until my wedding day) and, as I’m sure you have heard, it was owned by our family for over 50 yrs (my dad purchased it from the original owner in 1951, later my brother owned it as well as one of my sisters). If you have any questions or just want to share, email me any time.